New DNA results have allowed researchers to begin to look deeply into Group 01 of the Strother DNA Project. Below is my interpretation of four Big Y tests from FTDNA.com. (The Big Y tests 10 million positions on the Y chromosome.) Unlike the last Strother DNA article, this will not include a DNA tutorial. You may wish to review article 26. These families had a mutual ancestor at some point in the deep mists of history. Where and when is uncertain. But that such a man lived is fact. Most likely, he was born long before surnames emerged. It's not until we examine the next two positions, known as DYS449 and DYS464, that we find sufficient variation in the data to infer a possible story. All but one of the Strothers (of Group 01) have a value of 27 at DYS646. In the four present samples in that group, the Struthers have values of 28, 29, or 30. Similarly, all four Struthers have 15-15-17-17 at DYS464. Because of the volatile nature of STRs, we can't expect such a pattern to hold up consistently, but the trend is obviously present. Unlike STRs, Single Nucleotide Polymorphisms (SNPs) are stable. Note, however, that SNPs are not "defined" by nature. They are selected by researchers because they're found in areas of the Y chromosome observed to be, for whatever reason, especially stable. Unlike STRs, SNP mutations are rare, and once one occurs—a single genetic letter of A, C, G, or T transformed to one of the others—it tends to stay put for tens and hundreds of thousands of years. In other words, at position 7091297 on the Y chromosome, most men have the value of C, but those who have the SNP mutation known as ZP70, shown at the top of the following chart, have the value A. This is likely true of everyone in Group 01. Because the three Strother testers are descended from Jeremiah Strother (c1700-1741), a son of William Strother (-1702), we know that all the SNPs above his name were present in his cells when he was born ca 1700. Every male Strother descended from him will have them and, in many cases, a few more unique to his lineage. The Most Recent Common Ancestor to the Simpsons and Strothers, a man who may have lived around 1 AD, did not have any of them. So, how can this help in determining genealogical descent? Any Group 01 Strother who does not have all twelve of those Jeremiah mutations can not have descended from him. His lineage split up further up the tree. 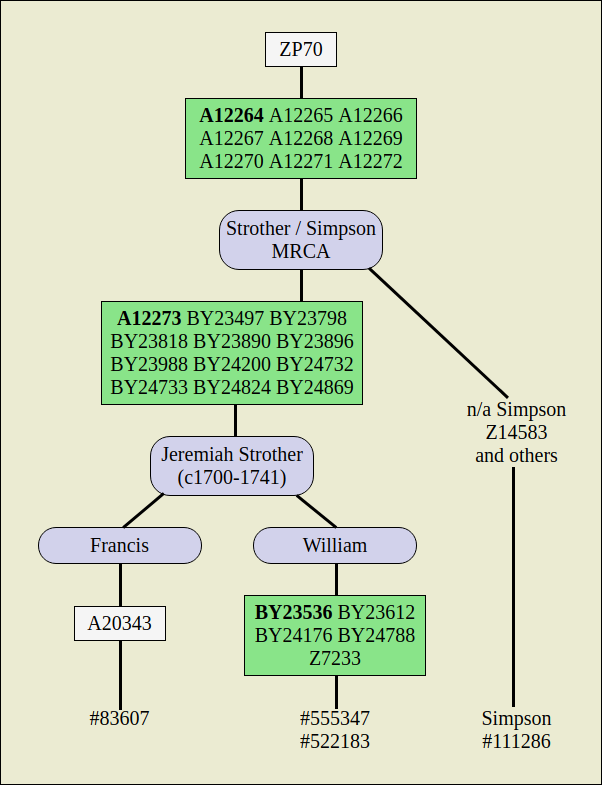 Because William Strother arrived in America in the 1600s, we can be certain that the four Scottish-born Struthers testers were not descend from William—and the DNA, by virtue of STRs DYS449 and DYS464 (as noted above)—is further evidence of the fact. I would suspect that the SNPs will tell the same story—that the Struthers will have some but not all twelve Jeremiah SNPs. Individual SNP testing is expensive at FTDNA—$39 each, a total of $468 for twelve, which is about the price of a Big Y. But SNPs can be tested at Yseq.net for $18 each—a total of $216. Finding just where that 12-marker block breaks will not tell us who the Struthers/Strother MRCA was, but it will provide a general era in which the surnames departed from one another. Since there were no surnames in Britain prior to about the 12th century, the break likely occurred between about 1200 to about 1600. My wild guess would be that the Struthers have eight to ten of the markers in the Jeremiah SNP block. All of humanity share about 99% of its DNA. That leaves a small amount that bears some variation. Some of that are the genes that code for the proteins that make up our skin, sweat, bones, etc. Most of it is non-coding DNA, and a small portion of that is the non-coding DNA on the Y chromosome, which is what we're looking at. The more DNA one person has in common with another, the closer the two are related. The further up the chart any two lineages diverge, the less they share and the more distant their relationship. For example, the Simpson tester noted above is not as closely related to Francis as William Strother is (of course). But Y-DNA-wise, he differs by only about those twelve Jeremiah SNPs. The most common haplogroup in Western Europe is called R1b, which emerged roughly 18,000 years ago. The most common subclade, called R-M269, consists of a block of about 110 SNPs, which, like the 12-block Jeremiah group (R-A12273) hasn't been parsed out any further for the simple lack of testers. Those 110 SNPs are believed to have emerged in the lineage between 6400 and 13,300 years ago. On the left is the SNP descent, as presently known, from R-M269 to Jeremiah Strother. Haplogroup R-DF49, a little more than half way down, is defined by the presence of two SNPs, DF49 and Y2599. In other words, there was a man born about 4300 years ago who had those two mutations, along with those listed above it (all inherited from X generations of paternal ancestors) and passed the whole smorgasbord on to all his patrilineal descendants, including to many of those reading this post now. Unless we find a birth certificate dated, say 21 June 2413 BC, we'll never know the identity of that man. But we do now know him as DF49. As time passes and more testers come along, the larger blocks, such as M269 and A12264, will continue to break down and the SNP tree will become closer to completion. The more complete, the better-known our ancestry.